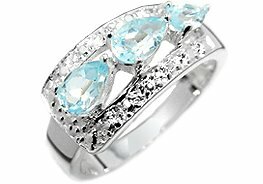 Gorgeous designer genuine blue topaz pear-shape ring. Cast in .925 fine sterling silver, this ring holds 2 pcs of 6x4mm and one 5x3mm genuine blue topaz pear-shaped stones with diamond illusion caps on the band. The total gemstone carat weight is 1.25 carats!